Known as the "Golden City of 100 Spires," Prague boasts a fairytale medieval Old Town, historic churches and synagogues, and perhaps Europe's largest castle. 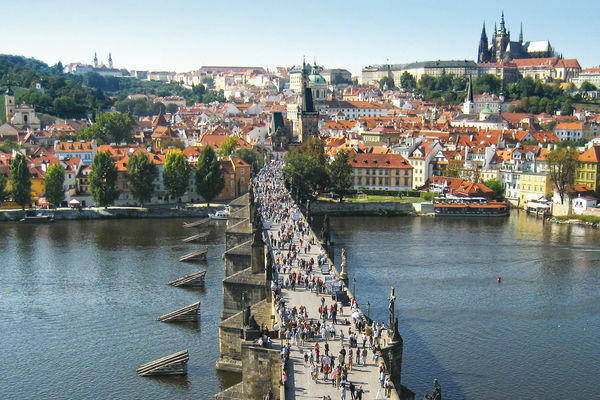 A good way to introduce yourself to the city, its layered past, and its resilient people is with a walk across town, starting on lively, urban Wenceslas Square, weaving through the atmospheric Old Town, and ending at the picturesque Charles Bridge. Huge Wenceslas Square, lined with great buildings and loads of history, is the focal point of Prague's modern, New Town Quarter. 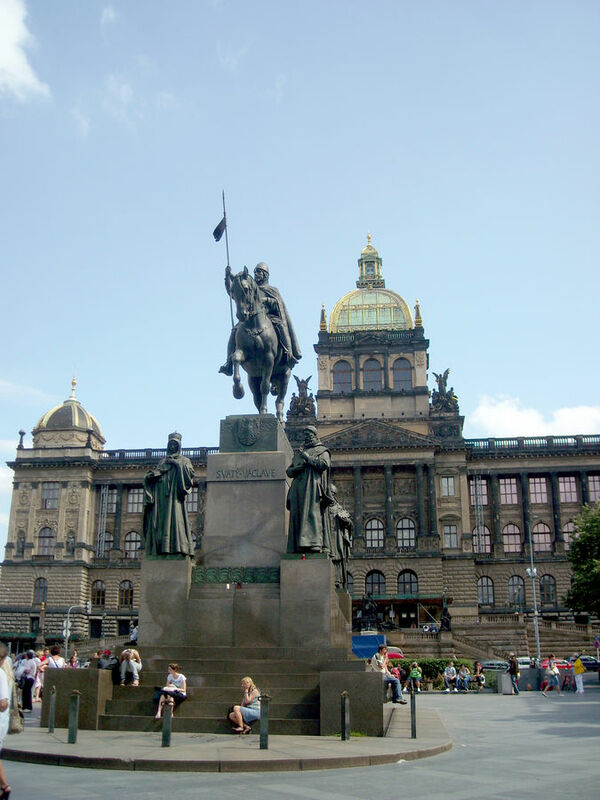 It's named for King Wenceslas, the "good king" of Christmas-carol fame, sitting astride the big equestrian statue at the top of the boulevard. The statue is a popular meeting point among locals, who like to say, "I'll meet you under the horse's tail." Wenceslas Square has been center-stage for much of modern Czech history: The creation of the Czechoslovak state was celebrated here in 1918. An inspiring memorial here commemorates Jan Palach and Jan Zajíc, two college students who set themselves on fire in 1969 to protest the Soviet Union's invasion of the Czech Republic the year before. Twenty years later, giant crowds converged on the square, jingling their key chains and chanting, "It's time to go now!" in the lead-up to the peaceful overthrow of the communist government. From the bottom of Wenceslas Square, it's a short walk down skinny, tourist-clogged Melantrichova street to Prague's quaint, compact Old Town Quarter. On the way you'll pass the wonderful open-air Havelská Market, a thriving hotbed of traditional-though-touristy Czech culture. Here you can browse for handcrafts, including fun "kitchen witch" marionettes meant to hang in your kitchen for good luck. 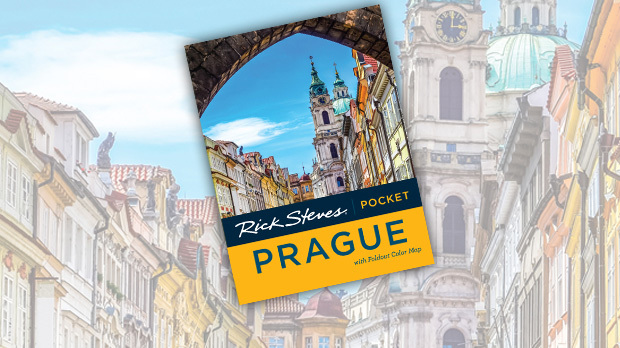 Whether in a crowded market, restaurant, or taxi cab, be aware of your surroundings — Prague is awash in pickpockets and con artists. Wear your money belt, pay with cash instead of a credit card at restaurants, and find out the going rate for taxis before you get taken for a ride. A couple of blocks from the market is the Old Town Square, surrounded by gloriously colorful buildings in a diversity of architectural styles: Gothic, Renaissance, Baroque, Rococo, and Art Nouveau. Chief among them is the towering Gothic Týn Church, topped by fanciful spires. The square's centerpiece is a memorial to Jan Hus. A short detour up the uniquely tree-lined Parizska ("Paris") street leads to the poignant Jewish Quarter, with museums, synagogues, and cemeteries. For me, this is one of the most powerful collection of Jewish sights in Europe. Parizka ends at a bluff that once sported a 100-foot-tall stone statue of Stalin. Torn down in 1962, it was replaced in 1991 by a giant ticking metronome, its concrete base now favored by skateboarders who love to film themselves "skating at the Stalin." From oppression to counter-culture, Prague has come a long way. Back at the Old Town Square, Karlova street (and a gaggle of tourists) zigzags down to the river to one of my favorite places for a stroll — the Charles Bridge. Under the communists, this pedestrian-only bridge crossing the Vltava River was empty, its big Gothic towers and statues of saints coated in black soot. Today it's a celebration of life, with a festival of artists and musicians all along its length. If you were to continue across the bridge, you'd reach the charming Little Quarter, and beyond that, the Castle Quarter, topped by the massive, must-see Prague Castle. A visit to the castle complex, with its quarter-mile stretch of churches, courtyards, and palaces spanning a thousand years of Czech history, can fill the better part of a day. The mythical founder of Prague — the beautiful princess Libuse — named her city "Praha" ("threshold"). The Czechs have always been at a crossroads of Europe — between the Slavic and Germanic worlds, between Catholicism and Protestantism, and between Cold War East and West. 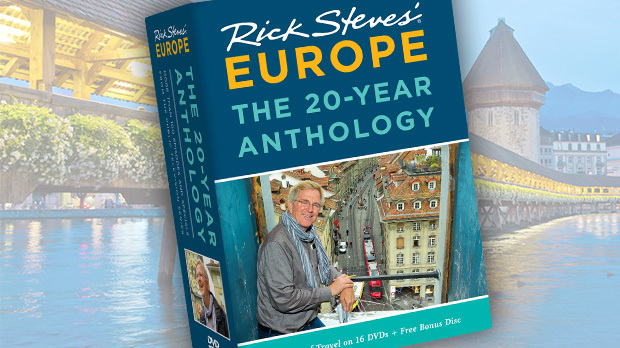 Despite these strong external influences, the Czechs have retained their distinct culture…and their enviable ability to find humor in life's challenges.